Today, I’m welcoming Witch Bolt into the world (and by world, I mean Ravelry)! 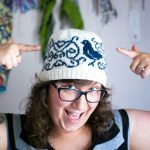 Witch Bolt is a Dungeons & Dragons-inspired, reversible double knit hat that is great for double knitting n00bs! A beholder stands before you, ready to wipe out your entire knitting group in one fell swoop! Little does he know, you’re a Level 3 Knitting Wizard. You point your knitting needle towards the beholder and a beam of crackling energy launches and attaches to it! You’re able to defeat this giant beast with your knitting prowess alone! Okay, that’s not exactly how a fight with a beholder would go, but we all know this is really about knitting. Witch Bolt is a Dungeons & Dragons-inspired double knit hat. You knit it up using two colors and when you’re done, it’s magically reversible! Just kidding, there’s no magic here, just your awesome knitting. 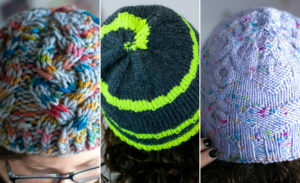 I have included links to video tutorials made by myself and others to get you up-to-speed on double knitting, so even if you’re a double knitting n00b, you can make this hat. This was one of my test knitter’s first double knit projects! Get 3 Dungeons & Dragons-Inspired Knitting Patterns for $12! 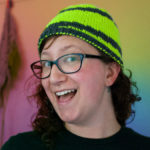 Previous PostPrevious Witch Bolt, A Double Knit Hat – Coming Soon!